What an awesome week I've had. A week away from work! 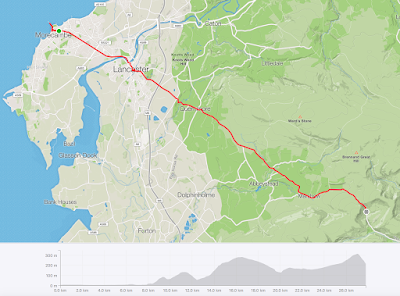 Lot's of cycling, running and adventure - just felt compelled to blog about it. The very first day of the week began with both a run and a cycle. It's been a while since I ever did that sort of 'brick' nonsense. I guess I'm not really a triathlete anymore. Our friends (Dave and Joanna) visited today too and it was nice spending a day with family and friends. Tuesday was a family day spent at Hanbury Hall. This was a really nice National Trust site where we enjoyed a walk, lunch and visit to the nearby church. Our friend Anna and her rug-rats spent the day with us too. Have cycled past this church so many times but this was the first venture actually inside it. Lunar, Jessica and I also found a secret tomb which was pretty ace. Not long after the below pics were taken, I stretched my legs a little too far and my trouser fly split. What a day! Wednesday was a lovely sunny day. Took my kids for a nice walk over the Studley fields and we visited the church at the bottom. Bonus - the church was actually open (is usually closed) so my kids were able to wander inside for the first time. My wife joined us shortly after and how great to spend the day as a family again. You can lead a sheep to water..
Later in the day we cooked outdoors using our new camp cooker and I have to say it's awesome. Sausage and steak for me! After a lovely lunch, tea followed not long after and that was a tasty pizza. Evening came and that meant a cycle and a stop at Purity brewery (and The Lark). Ron and Doo at Purity. Cheers! Felt a tad rough when I awoke Thursday morning. Only one thing for it - a cycle and a run. 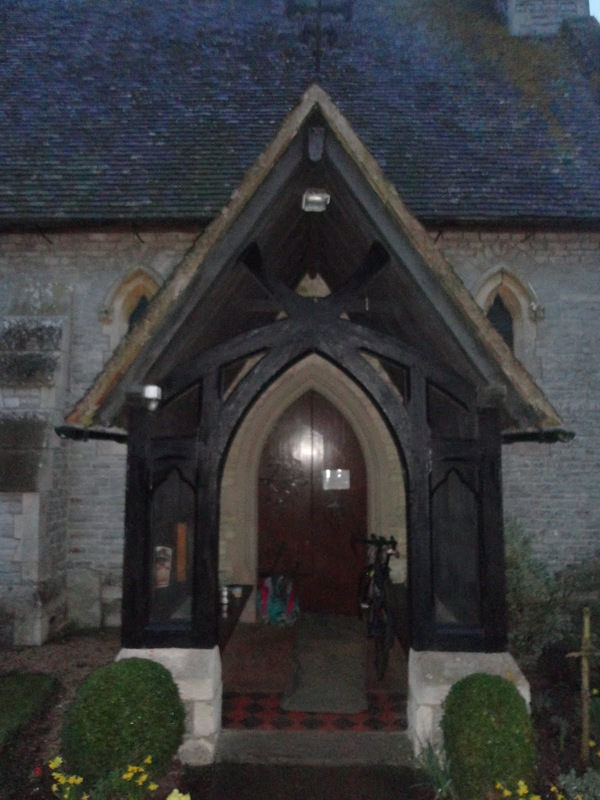 Cycled to Hanbury Church again and re-remembered Monday's adventure. Saw a 'nest' of ladybugs which completely blew my mind - had never seen anything like that before. I actually saw a 'loveliness' of ladybugs, as that is what a group of the bugs are called. How lovely. My run was over the fields near my home and oh man, the pollen could be smelt in the air. Hay fever menace! Caught up with my blind buddy Roger on Friday. 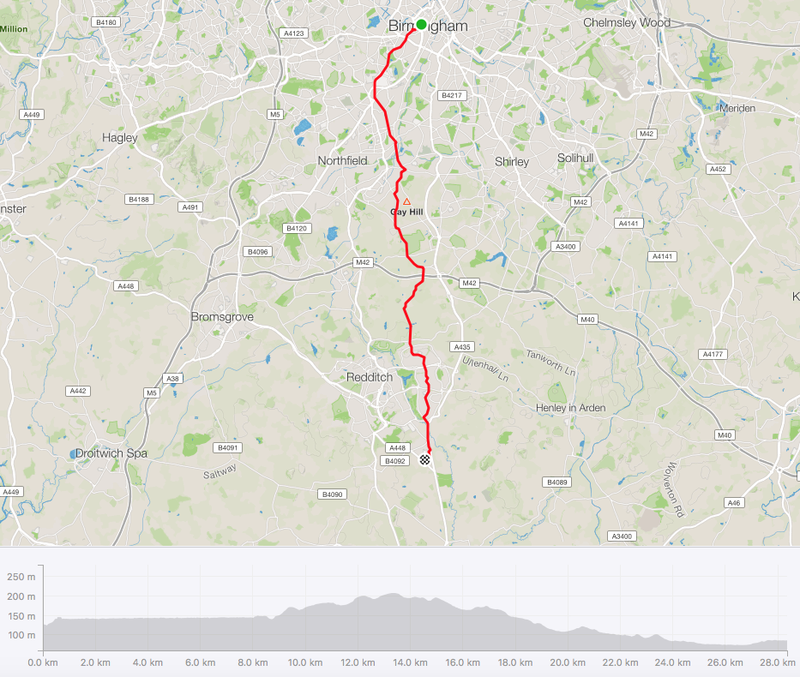 We cycled to Hanbury (my 3rd visit this week) on his tandem and back. As usual we stopped for a tasty breakfast. So sunny today, spent the afternoon in the garden with my family. They made mud cakes and enjoyed a splash in the paddling pool. I cleaned my bike and enjoyed a beer with my wife (I had not forgotten SJ on my Purity trip and purchased these bottles for her whilst there). My dad rocked up too and informed me he had cleaned my car - bless him. 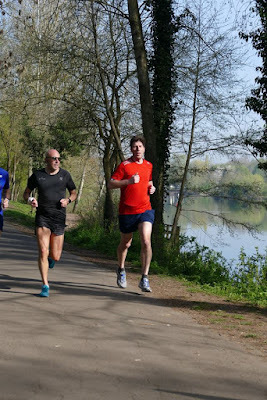 Saturday saw me complete my PAM (ParkRun-a-Month) for April. I was disappointed with my time of 23:12 as I was slowly improving month by month this year, with last months run being 22:39. I guess the excess of food and beer did not help. This was my 23rd ParkRun to date and I finished 73/460. My fastest ParkRun time remains 21:39. Following the ParkRun, I went on an Easter walk with my Ecclesia. We must have walked about 5k on this beautifully sunny day. My daughter Lunar walked with me and we both found a hidden tunnel - bonus! After our walk, we met up with other folk from my Ecclesia and had a great lunch at the Bennett's. Nice to fraternise (and have a few winks in the garden) before SJ took me for a hot pod yoga session. Don't think I could have fitted much more into this day. Finished the week by running a further 5k and completing April's BAM (bivvy-a-month) challenge. Ron randomly asked if I fancied a wild camp. Of course I did! We cycled to a secret destination which we previously dubbed 'The Cart Woods'. (Secret destination coordinates were flexibly.victor.gracing). 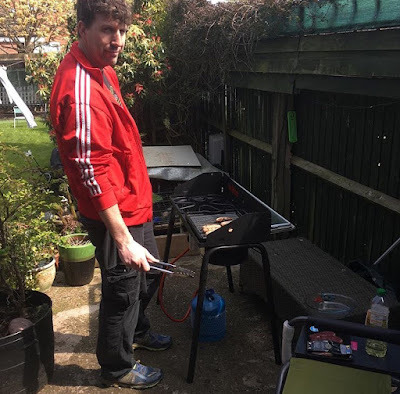 After pitching camp (bivvy for me, tent for Ron) we got down to some cooking. Sausage and beans - delicious. I renamed the woods the 'A La Carte Woods'. Ha! This delicious meal was washed down with some miniature whiskeys - one was 16 years old (I think) and very nice, it was a Tomintoul delight. The other was a Glenfiddich and not quite so nice. The whiskey helped us settle down for the night. The sky was beautiful and starry, however, the moon could not be seen. Not until 3 a.m. anyway, then a bright (nearly full) moon shone. This was the Pink Moon and how great to camp out beneath it. Got a tad cold in the night but was on the whole ok. I thought the night was going to be warmer than it was (guess it's not quite summer yet). Real nice to see the sun rise in the morning (and indicate which direction we were facing). Chuckled when morning light came that we managed to pitch camp in the dark (and reflected on the many stinging nettles that stung my fingers). A quick porridge and a cup of tea before dismantling camp and returning home to my family. What an awesome week. Had some much fun and wham, completed a PAM and a BAM! Work definitely gets in the way of adventure! Discussed #transengland19 with my buddy Jamie and a plan was born. We would cycle this event 'Macadoo' style. Basically, we would ride the event, pinching another's route and cycle it when we were able (which turned out to be just 6 days after the 'official start). Getting to the start was simple enough. Cycled from home to Birmingham New St. Met with my buddy Jamie and caught the train to Morecambe. After a quick stop at Aldi (for water, emergency pasty and Titan choice bar) headed to the Morecambe Pier and tweeted obligatory start photo. De-Ja Vu feeling at the start, as Jamie and I had been here before. Memories of our Way of the Roses (coast to coast to coast) trip with Toll came flooding back into my head as well as my Trans-Pennine Trail (coast to coast) solo adventure too. Oh, what would this adventure hold? Well, the first 30k to checkpoint 1 went smoothly. Sure it was dark, and hilly, and cold and windy too - all that we were expecting. Everything was feeling kinda ok and as it should. We were both feeling the climbs and slowly losing feeling in our cold toes and fingers. It was nice to reach the checkpoint (St Huberts RC Church). We stopped and ate our emergency pasty's. It was so cold, we both max layered up - Jamie was given my spare silk socks as he hadn't brought shoe covers with him. This was maybe the start of mis-hap?! Further menace was the fact that my helmet had died. The strap mechanism 'thing' had snapped on both sides and it wouldn't fit snugly round my head. Fixed the helmet (well, Jamie did) by using zip-ties to attach it securely to my head. Leaving this checkpoint we shivered, but not for too long as the ascents soon warmed us up. The welcome descents would re-freeze us and this pattern continued for a while. After a spell Jamie informed that we had gone off-route. I didn't believe him as my Garmin was following a breadcrumb trail just fine indicating all was well. Jamie's lights were playing up and perhaps his Garmin was too. Not too far into the ride and we were both feeling sleepy. As fortune would have it, we spotted a McDonalds just off route. Perfect place for a fuel! Perfect place for a warm too. And a sleep. Jamie was soon counting sheep! What wasn't so great was the fact that we realised it was my Garmin that had played up and we had gotten a good 25k off route. 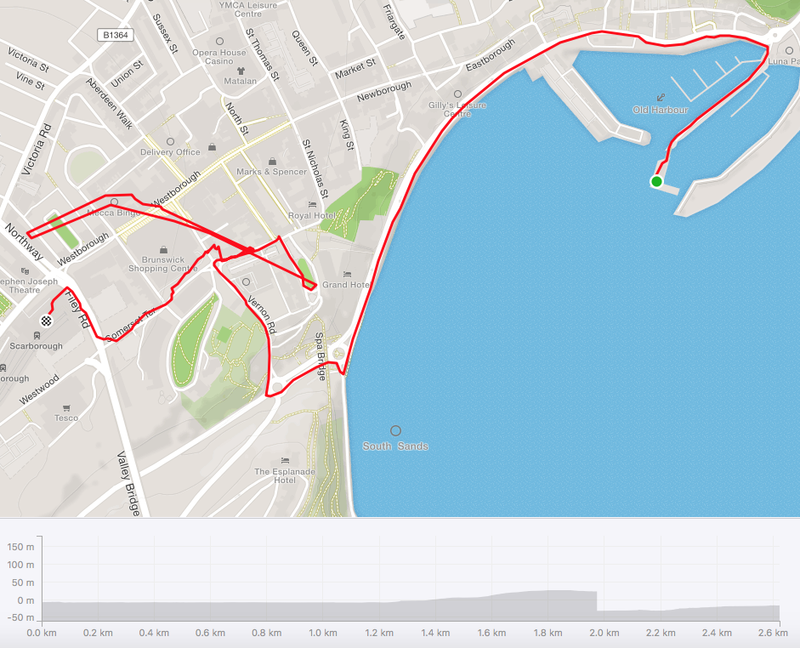 Not sure what happened to my Garmin - this Edge 1000 had not played up before. 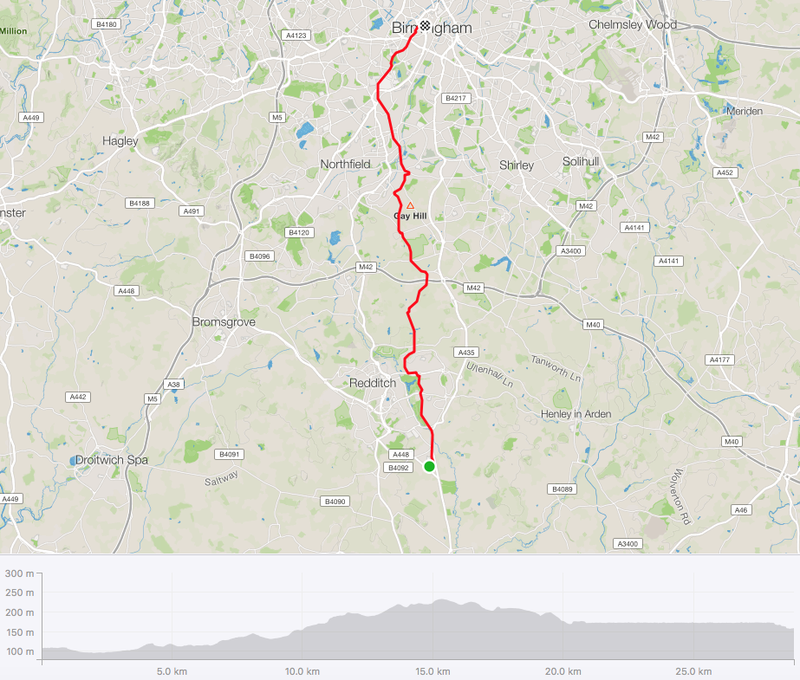 Why was my Garmin sending us toward Sheffield?! We figured if we double backed to where we had started going wrong that would add like 50k to our route. Hmmm, heading for Checkpoints 2 and 3 now would add serious time and mileage. We decided we would head for checkpoint 4 which was St Nicholas Church in Barnsdale. A Google search wasn't too fruitful, however, we thought we found the postcode to said church which was roughly in the York direction. We slept on our decision making and when awake again we had breakfast! Ooh, we dove love a Maccy D's! On track for the first 30k! Our plan seemed quite ace initially - we were cycling some great hills and roads. So beautiful, it reminded us both of Ireland. After a while though, the hills disappeared and A roads made an appearance. Much of our cycling was relatively flat which was ok on the nice greenways but not so fine on the busy roads. A real mixed bag of cycling. Oh well, we thought, soon be back on track. When we eventually reached St Nicholas Church, we were well aware that it was not checkpoint 4. Oh no, we had cycled to a bogus checkpoint. Plans would have to change again. We were miles off route and getting back on track to head to checkpoint 5 was not going to be an option. Damn, blast, no Robin's Hood Bay beach for us. Despite all may coast to coast trips, I have never been to Robins Hood Bay. Another adventure perhaps. With so much chaos in my headspace, only one thing for it - a few more winks (not the first time I have slept in a church). After wakening, our decided mater plan was to reach the finish in Scarborough. 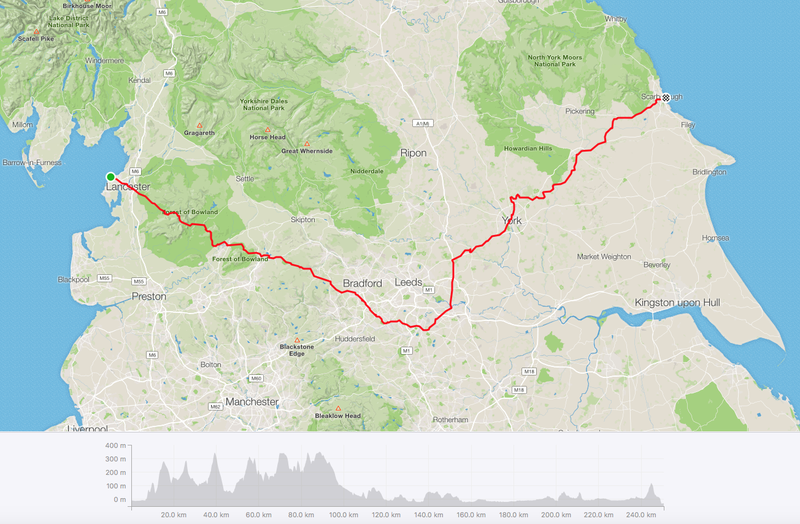 60k of mostly A road (but inter-mingled country roads and cycleway) took us right into Scarborough. At times we stopped for feeding. The most notable feed was my Indonesian (I think) pizza and Jamie's partisan (?) chicken thing. Jamie seemed to pick up speed on this final leg and it felt like a zoomy race to the finish. When in Scarborough, it proved difficult to spot the pier. I asked a lady for directions who replied 'I'm not listening to you' - how rude! The loud sounds from the many amusements and the beach gave it away. Aces, we had found the finish and took an obligatory finish photo of the 'Divng Belle' to prove we had completed the #transengland19 race! Aces. Yeah, so we finished late (and last) and only ticked off one checkpoint but finish we did (a number of other racers scratched) and completed another CTC adventure. 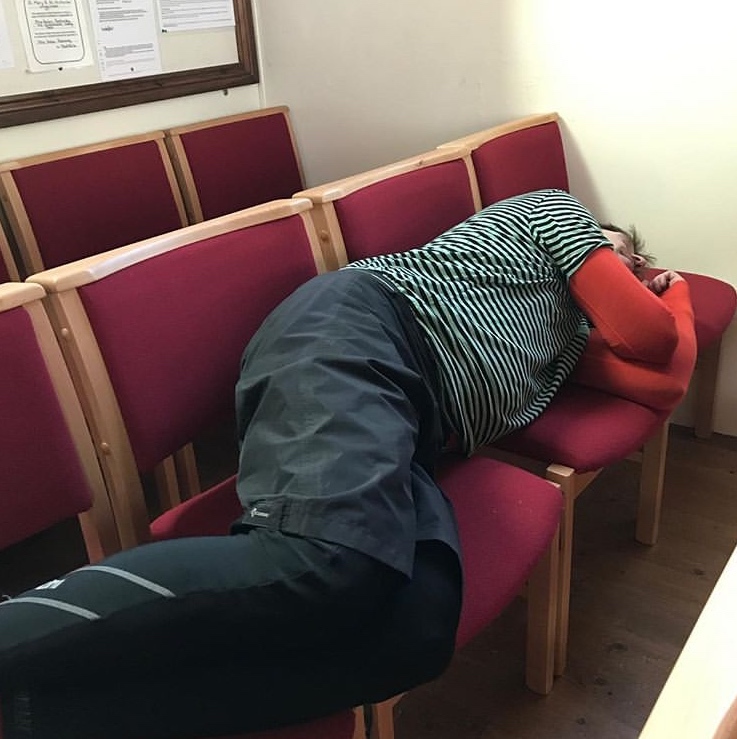 Doo completes the #transengland19 race! Jamie (Mac) also complete the #transengland19 race! Tweeted my finish photo and lo and behold, The Racing Collective 'liked' my Tweet. Proof in the pudding and all that. Ha! What a (mis)adventure! Part of our plan was to wild camp at the finish. It was cold (freezing, I think) and Jamie decided we could make further changes to our plan and booked us into a Travelodge! I guess we had finished the race and were at liberty to do what we liked! Oh man, we slept well at the Travelodge. Jamie would have shared the big bed, but I chose to sleep on the floor as I wanted to test out my new (kindly replaced) Alpkit air mat. We both slept well and how great it was to have a decent sleep. In the morning, we had a further McDonald's and then boarded a train back to Birmingham. From New St we both cycled to our prospective homes. What an adventure! It's been a wee while since I last posted a blog update. So much so, I was a year younger when I posted last. Oh man, I'm sure the ageing process slows us all down. Interesting that 2 of my birthday cards had chameleons on the front. Were folk telling me that I needed to change? Well, on reflection, there's a whole bunch of stuff I need to change. Maybe I should change my job as it's a menace and quite a stress at times. Guess I should have changed the rotation of the picture above. Still quite a porker, diet needs to change. My mojo comes and goes - that definitely needs to change too. Then again, perhaps the only thing that really needs to change is my mindset?! Should I be the very best at anything, why would I want to change? Ha! I'm not that narcissistic and don't really believe that I'm the best at anything. Except, what I do know for sure though is that I am best at being me. Since I posted last, I have done little in the way of exercise or adventure. 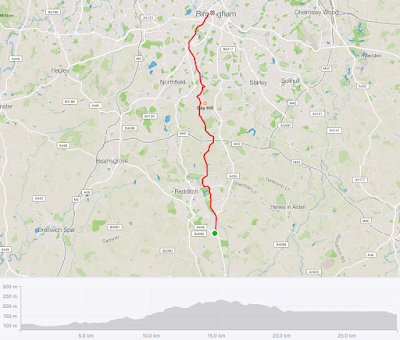 Sure I ran a little and cycled the odd commute or jolly but nothing super adventurous. 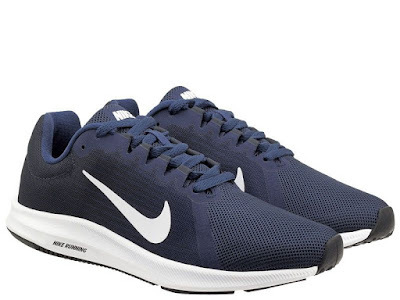 My new shoes (Nike Downshifer 8) appear just fine - they are light, relatively comfy and as mentioned before cheap. 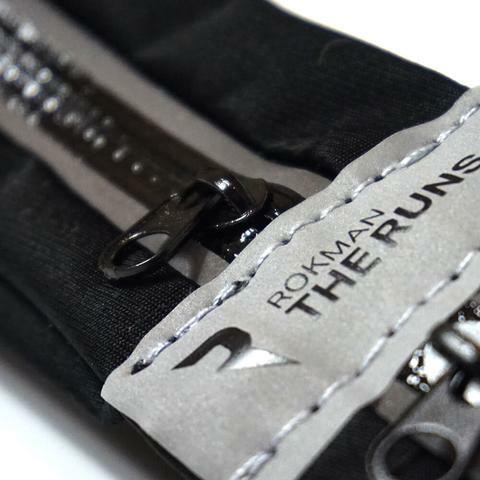 I also got a new running belt too - a Rokman running belt. This belt is aces and has a super slim and sleek design, 2 super expandable pockets (which easily fit my big bulky bunch of keys and iPhone and it's water resistant too). Hope I don't get the runs! If I'm to make any real change at all, it will be that I will look for more adventure. 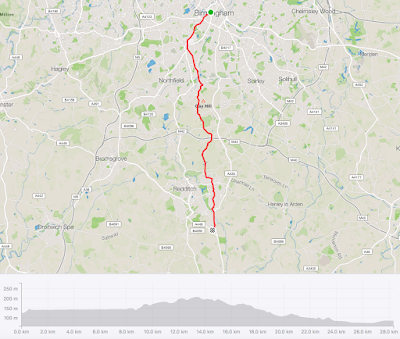 I don't have to look too far ahead either - I have a CTC ride planned next week! Oh the joys! "Bikes mean the same thing to me now. 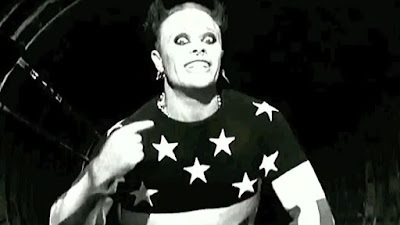 When you’re scratching, it’s that buzz of doing something you love, that freedom. In your mind you know when you’re on it and you’re just flowing." Not long into the month of March and it's proper crazy already. Sadly, Keith Flint from Prodigy died on 4 March 2019. He was into bikes too - who'd have known?! I remember him playing a set at Glastonbury Festival one year that I attended which was pretty awesome. 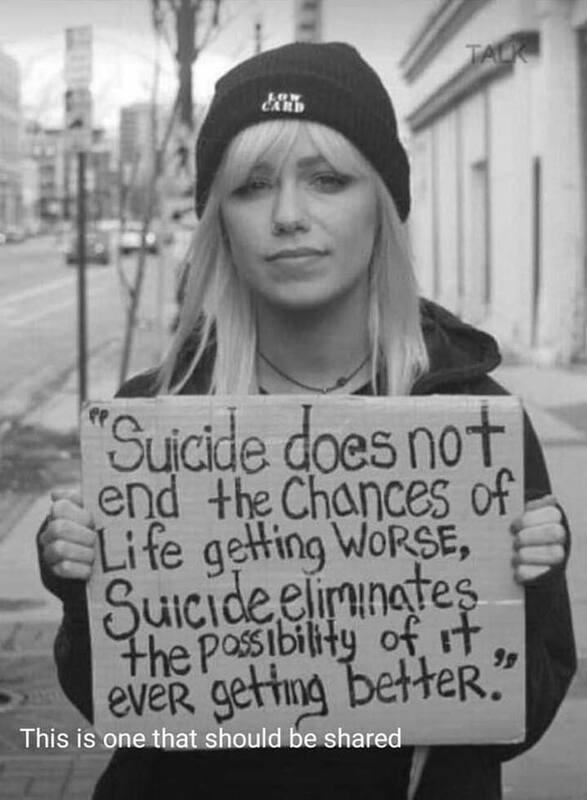 It is believed that Keith took his own life. How sad. I'm sure Keith will be sorely missed. On a brighter note, I had already completed March's BAM (bivvy-a-month) as posted previously. 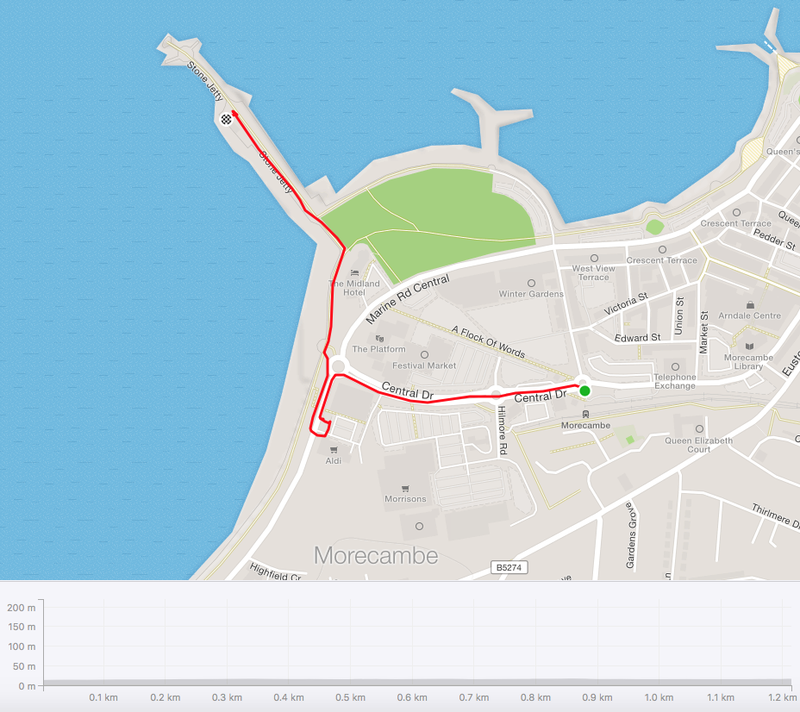 Today, I completed March's PAM (ParkRun-a-month) too. Ha! I'm not sure I'll complete my PAM challenge but that is certainly a current aim. All my runs (and cycles) are recorded on the Strava App which is a pretty neat social fitness network. It's main use is to track my cycles and runs using GPS data. One of the great things about it, is the fact that it will let me know when I need to retire a pair of shoes. Strava informed me that my Brooks Ghost 8's had ran over 800k and suggested I treat myself with a new pair. I was happy to retire these shoes to be honest, as I never really liked them. They were expensive (around £100) and uncomfortable. Only too happy to follow Strava's advice and a new pair of shoes was swiftly ordered. I purchased cheap shoes this time around (mostly because I was not so financially flush) and went for a pair of Nike's Downshifter 8's. These shoes got good reviews and only cost me £33.70. I have yet to test them but am sure I will and most probably blog about them soon. My new shoes did not arrive in time for my ParkRun today (but were delivered just after). So, I ran in a resurrected pair of Brooks Ghost 4's. These shoes were great and I loved them back in the day. The Brooks Ghost 8's that I just retired were essentially an updated model but for whatever reason did not compare to these shoes. Good karma wearing these old shoes today - I ran my fastest ParkRun this year! My run didn't feel great, however, I finished 64th out of 516 and ran a time of 22:39. Each ParkRun this year has been progressively faster - I hope this continues. My PB is exactly 1 minute faster. Will I ever beat it?! For this month's bivvy-a-month (BAM) challenge (March), I figured I would try something a little different. For a start, I would be solo as all my buddy's were otherwise engaged. Champing, I decided, was the way to go. 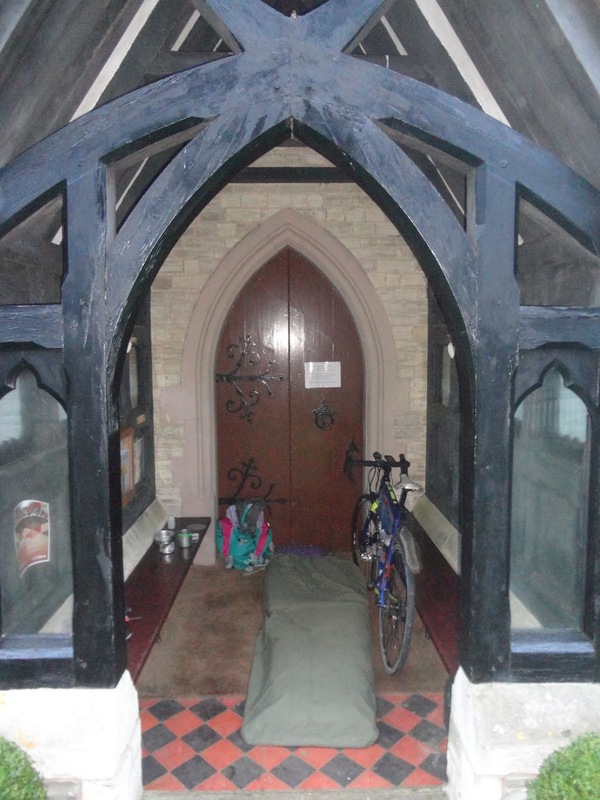 Champing is 'the unique concept of camping overnight in historic churches'. Hmm, aren't all churches historic? There were a whole bunch of churches not too far out from my own front door. I decided to go and try my luck. First church I encountered was Sambourne Mission Church. This church doubled as a village hall. Sadly, no champing here as the church was locked. Next church I encountered was St Paul's Church in Cookhill. This church was certainly historic, it was built in 1836. The noticeboard stated 'Your Church is Open', but it wasn't. No champing at this Gothic Revival structure. The third church I encountered was St James Church in Weethley. This was a very attractive looking church and was built in 1857. This church overlooked the Cotswolds. This church had a sign on the door stating 'The church is open', but it wasn't. Grrr. I had been inside this quaint church before, why did they decide to lock it? Despite not being able to get inside the church itself, it did have a rather lovely porch entrance. Shelter from the wind and rain and large enough to accommodate bike and bivvy! I decided I would camp here. Does this qualify as champing?! Champing or not, I felt like a champion. I had completed month 3 of my BAM challenge. Woo hoo, that was 25% challenge completed, only 9 months to go. Sleep was not the best this night, however, it was ok. The frequent sound of birds (mostly ducks in the nearby pond) kept awaking me. The sky looked moonlit but I could not locate the moon at all - strange. The stars sure shone bright. When morning came, I cooked a celebratory breakfast of porridge and washed this down with a cup of jasmine green tea. Packed away my gear soon after and cycled home. Once home, SJ looked after her 'wild animal' and cooked me a further fried breakfast. Subscribe to my blog and win cash! Buy me a cuppa T, please? !